IndonesiaTravelVisit.com | The South coastal line of Java is indeed full of unique tales, including that of Baron Beach, which is said to be where a miraculous bule was stranded. You could imagine the tale from the shady shore, or from the tall lighthouse. 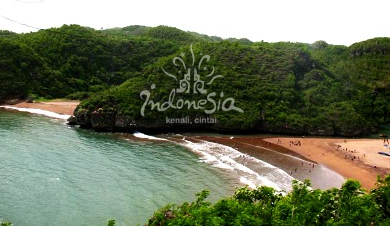 Few black clouds were hanging in the sky when IndonesiaTravelVisit.com went through the winding road along Gunungkidul. A hot, dry aura saw us along the way, becoming just a perfect background for the rocky hills that's the icon of the district. The ambiance suddenly turned fresh when we wen through the entrance gate into Baron Beach, where the lines of dry teaks were replaced by fresh, green trees. The sound of the wave was heard, calling us from far away, making us rushing for the feel of soft sands and the ferocity of the Southern Sea. Having passed through the inviting line of sea food kiosks, we arrived at the fascinating shore of Baron Beach. The U-shaped beach is between two coral reefs on both sides, defending against the wave of the Southern Sea that keeps raging. In the West, there is a freshwater river flowing from God-knows-where. The river, only few hundred meters in length, ends right to the shore of the beach, presenting a unique view when the freshwater and the saltwater greets one another. Tens of boats were waiting in line on the brownish white sand, waiting for the tide to come to take them to the middle of the sea later at night. Savoring the view, a question crossed our minds: why is the beach named Baron? 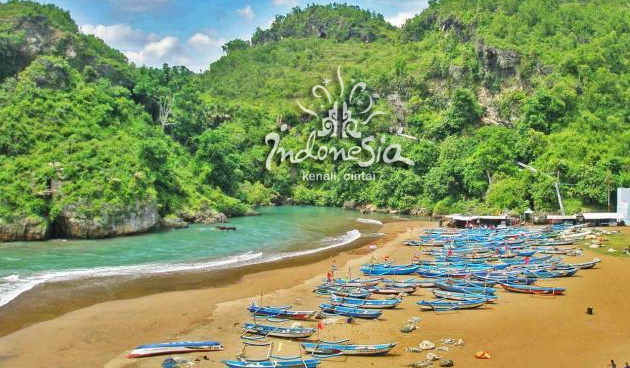 The name is rather strange as it doesn't sound Javanese at all, unlike the names of the neighboring beaches such as Krakal, Kukup, and Indrayanti. Stranger is, the word "baron" is actually derived from the lowest level of noble title commonly used in a number of European kingdoms during the Middle Age. 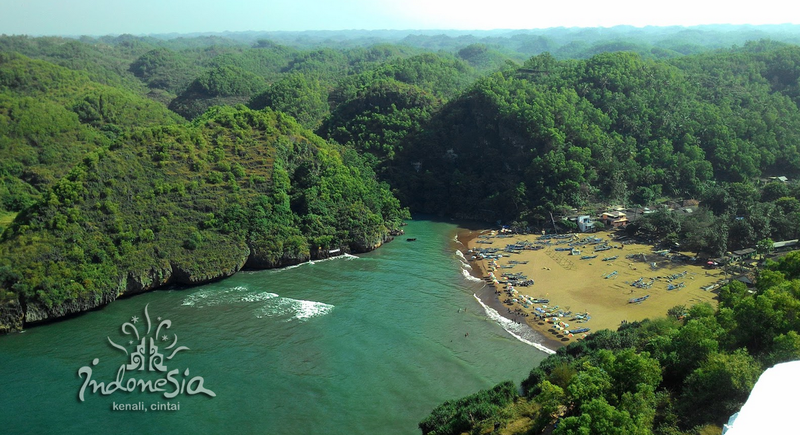 How could a very londo ("western") word becomes the name of a beach in the far edge of Gunungkidul? After tracing back for a while, we found out that the western name actually refers to the ketoprak figure, Baron Sakeber. Unlike the common ketoprak figures, Baron Sakeber was a Netherlands nobleman (some said he was a Spanish or Portuguese nobleman) with prominent magical power; it was also said that he once fought against Panembahan Senopati, the founding father of the Mataram Sultanate. And so it was, in the 1930s, the Netherlands used the beach as a hiding place and for storing their weapons; back then, there were only few people living around the beach. We started to think that, perhaps, the beach was named Baron since there were once many Nederlanders living nearby, which was then interrelated with the legend of Baron Sekeber. The beach was then known as Baron Beach to memorize the tale of the miraculous bule (AH Farhani, 2008). From above the coral hill in the East, you can see a white tower soaring high near an abyss, reminding you of Minas Tirith in The Lord of The Ring Trilogy. Being curious we were, we headed to the tower through stone stairs right to the East of the beach. We were required to pay IDR 2000,-/person for the maintenance fee of the stairs. After few hundred meters, we arrived at the complex of Mercusuar Tanjung Baron (Lighthouse of Cape Baron) right on the peak of a coral hill, just like Minas Tirith was on The City of Kings. What's different is that there is no city below he lighthouse; there's only vast ocean with its wild wave. According to the lighthouse warden, the white tower was recently built in February 2014 and was made official in December the same year. The 40-meter-high lighthouse was built to replace the old one, which stood just beside-a rusty iron tower. Aside from replacing the old tower, the new tower was also built to attract more tourists to visit Baron Beach. The tower maintains its original function of guiding ships, though nowadays most ships have been built with more sophisticated navigation instruments. "There are times when the sophisticated instruments break down or lose accuracy; that's when a lighthouse plays an essentially crucial role for ship navigation," said Pak Jacob, one of the wardens charged with ensuring that the Lighthouse of Cape Baron functions properly. "Lighthouse functions as distance marker, and each one is separated 12 nautical miles (approximately 22 km) from another, all are operated by the Directorate General of Sea Transportation, with its headquarter in Cilacap. The light above the tower spins to attract sailors' attention." 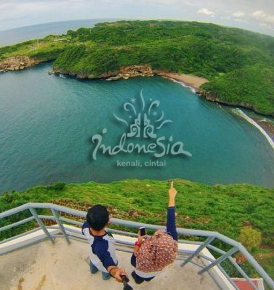 With IDR 5000 per person, you can enter the lighthouse and enjoy the landscape of Gunungkidul from the height. The room inside the lighthouse is considerably large, consisting of 9 polyangle floors. Each individual floor is connected by a relatively steep spiral stair that gets narrower as it ascends. On each even floor, there is a balcony from where you can observe the view around the lighthouse. On the 7th floor, the spiral stairs is replaced by a slippery vertical stair; it is recommended that you put off your footwear when stepping on the stairs. Once you've got through the somewhat horror stairs, you can then see a spectacular view: the line of limestone hills spreading long in the North, providing a contrast against the wavy ocean in the South. From the top of the tower, wind blows softly, sending peace to the exhaustion you might feel while you're ascending the steep stairs. The vast ocean becomes a perfect background for taking photos in different poses; still, you are advised to be careful with the strong wind that sometimes comes from the sea. The top of the lighthouse also has a number of sensitive instruments in it-ones we cannot touch, such as spinning light, batteries, and solar cells supplying electricity to the whole part of the lighthouse. The thing is, you are advised to be careful and observe caution so as to not cause any damage to the building, considering that its function is vital to the sailors sailing across the Indian Ocean. That afternoon, we enjoyed the view of sunset behind the lighthouse. Though it was a bit cloudy, dramatic ambiance kept emerging and eventually succeeded in making us chill due to its beauty. We returned home with smiles on our faces, after enjoying an enchanting sunset at the beach of the miracuous bule. 0 Komentar untuk "PANTAI BARON The Tale of the Miraculous Bule and His Tall Lighthouse"